New Government is taking each and every step to keep the nation in confidence and defy what the opposition say. To prove this and to spread awareness about the recent increase in taxes on several items, the Government of Punjab claimed that the taxes have been implemented in a way that it will effect only big fishes and a common man won’t feel the heat of these taxes. In this regard New Government has issued a circular in which they have mentioned the prices of the regular commodities of regular use like wheat, oil, peas etc. 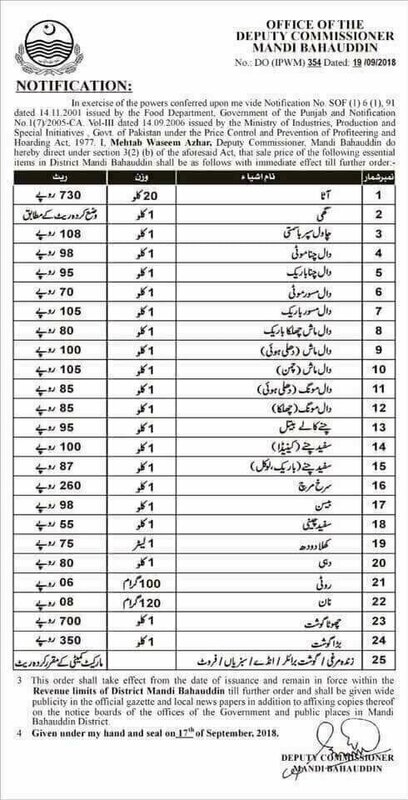 So that the people are well aware of the prices and should report if they are being overcharged by shopkeepers on the name of new taxes. The notification/circular is self-explanatory and will clear the air between the Government and people. By such steps Govt. will be able to retain the trust of the people and in the same way people will be aware of the whole situation and won’t be misled. The circular is as under.